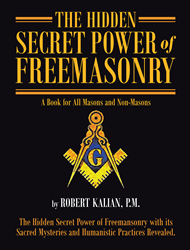 Recent release “The Hidden Secret Powers of Freemasonry” from Page Publishing author Robert Kalian, P.M. is an in-depth exploration of the history and contemporary configuration of the secret society. “It might be entertaining to be anti-Masonic and perpetuate conspiracy theories based on satanic worship, but this book is dedicated to neutralizing such negative ideologies, and instead brings to light the significant works of the greatest fraternal organization in the world,” Kalian, a Mason of fifty years and a member of the Scottish Rite for forty-six, said of his book. “The Masonic term ‘making good men better’ is the desire of the craft concerning all people living in a multicultural society to better themselves. This is masonry in a nutshell. This is a book which cannot be read in one night. The reader must be very patient in order to comprehend what the true meanings of Masonry is really all about."